one crumb at a time: Alice B. Toklas and her cook book - Part One. Alice B. Toklas and her cook book - Part One. 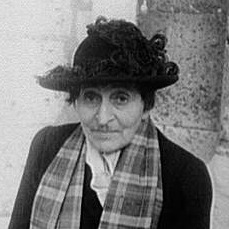 Who was Alice B. Toklas? Alice Babette was the only daughter of Ferdinand and Emma (Levinsky) Toklas, born in San Francisco on 30 April 1877. As a child she lived a comfortable and cultured middle-class existence surrounded by the female members of her mother's family, women interested in flowers, gardens, food, music and fashion. At eight she travelled to Europe with her parents; a few months after her tenth birthday her brother Clarence was born and at sixteen she entered the University of Washington to study music. (Her father's business interests were in Seattle and Olympia and the family was living in Seattle at the time.) She was all set, as her biographer suggests, to 'glide quietly into the coming century, comfortable in the Jewish middle class, a well-trained flower of pale Victorian womanhood'. The wheels started to fall off when her mother became ill and the family returned to San Francisco. Alice, aged eighteen, was required to take on the role of housekeeper. Emma Toklas died in March 1897, just before Alice's twentieth birthday, and Alice, Clarence and Ferdinand moved in with her widowed grandfather, Emma's father, Louis Levinsky. Although she mixed with musicians (she had the idea of perhaps becoming a concert pianist), artists and writers, went to the theatre and to restaurants, she lived in a male dominated, highly conservative household where she was valued largely for her efficient housekeeping. Like most young women of her class she had been brought up to be a lady and a 'perfect hostess' who would eventually make someone the perfect wife. By 1904 her grandfather was dead, her brother was eighteen and no longer requiring her ministrations and she had given up the idea of a musical career. Alice began to think of escape. Alice's friend, Harriet Levy, was a friend of Sarah Stein, wife of Michael Stein, the older brother of Leo and Gertrude. In 1903 the Michael Steins had gone to join Leo and Gertrude and settle in Paris, taking with them another of Alice's friends, Annette Rosenshine. At the end of August 1907 Alice and Harriet also left San Francisco to join the Stein circle. Almost from the moment she meets Gertrude in Paris, Alice and Gertrude become GertrudeandAlice with Alice fulfilling her role as the perfect wife. Gertrude writes and Alice works assiduously nurturing Gertrude's genius. Both of them become popularly well known after the publication of The Autobiography of Alice B. Toklas written by Gertrude and published in 1933. Before this date Alice is just plain Alice Toklas. It is Gertrude who chooses the name for the book despite Alice's protestations and she is Alice B. Toklas from then on. Gertrude dies in 1946, when Alice is 69, and she spends the next twenty years maintaining the Gertrude Stein legend and crafting anecdotes about their lives in her own books The Alice B. Toklas Cook Book and What is Remembered. Why did Alice write a cook book? By her own admission it was at least in part because she needed some money. Although Gertrude Stein had intended to leave Alice well provided for, after Gertrude died Alice lived in ever more straightened financial circumstances. The idea of writing a cook book however was something she and Gertrude had discussed. According to Linda Simon (Alice's biographer) a plan for a cook book of seven chapters interspersed with recollections had been written on the inside cover of Gertrude's copy of James Fenimore Cooper's The Pilot although there is no indication of when this was done. Simon also references from amongst Stein's papers a note by Gertrude that 'Alice is at work planning a cook book and reading recipes', that 'she is deep in descriptions of cake she will never make', which dates from 1946. Their friend Carl Van Vechten claimed to have witnessed two occasions when Gertrude had ridiculed Alice about the idea of writing a cook book despite Alice having long wanted to do so (Souhami, p. 260). In a letter to Carl Van Vechten in November 1946, Alice admits to having told Thornton Wilder that she might write a cook book and he had responded 'but Alice have you ever tried to write'. Perhaps those scenes with Gertrude were also in her mind when she wrote her famous final sentence 'As if a cook-book had anything to do with writing'. Alice had collected recipes from childhood and had a reputation as a good cook but her publishers were probably less interested in her recipes than in her memoirs (Simon p. 217). More particularly they must have been interested in what Alice could tell of the years not covered by Gertrude in The Autobiography. Carl Van Vechten thought that her clashes with Gertrude had made her wary of writing anything and certainly anything about their life together. For her part perhaps Alice was flattered by the attention she was receiving (she was also approached to write articles for Vogue and House Beautiful), perhaps she realised that using food as the basis for her reminiscences meant that she could easily control just how revelatory they were, and, after all, she could do with the money. In the publisher's note to the 1984 edition of The Cook Book it is Alice who suggests to the publisher that she write a cook book full of memories rather than a book about her life with Gertrude Stein. Where did her recipes come from? When treasures are recipes they are less clearly, less distinctly remembered than when they are tangible objects. They evoke however quite a vivid feeling – that is, to some of us who, considering cooking an art, feel that a way of cooking can produce something that approaches an aesthetic emotion. What more can one say? If one had the choice of again hearing Pachmann play the two Chopin sonatas or dining once more at the Café Anglais which would one choose? Cook books and reading about food and cooking had always 'intrigued and seduced' her. She discussed food with cooks and chefs she met on her travels, experimented to reproduce food she had eaten in restaurants and exchanged ideas with her friends. Amongst her collection she had 'priceless recipes from three chateaux manuscript cook books' from the eighteenth and early nineteenth centuries as well as books which she had received as gifts. Gertrude gave her ' very important' cook books for Christmas (such as Montagne and Salles The Great Book of the Kitchen) and friends regularly sent her the latest publications (such as Wanda Frolov's Katish: Our Russian Cook published in 1947 from W. G. Rogers). But a recipe collection does not make a cook book, as Alice discovered. She found the process of writing the book a 'grind' and the effort was difficult and tormenting, at least in part because she was now 75 and recovering from jaundice, but she plodded on 'despairfully'. The chapter entitled 'Recipes from Friends' (which included the notorious Hashish Fudge recipe) was a device to make up the short fall of words in what she thought of as a 'deadly dull offering'. Alice had neither the time nor the means to test any of the recipes she included, instead she spent the winter of 1952 bent over an 'imaginary stove'. She was both shocked and furious when told about the hashish fudge, it would appear that she had not even bothered to read the recipe before including it with the rest of the manuscript. In her foreword to the 1984 edition of The Cook Book M.K.F. Fisher notes that the first edition listed ten errata of which only three were significant. Linda Simon discusses one of these, the amount of milk required for the croissant recipe (p.219) which, when discovered, left Alice 'ashamed and confused'. At one time a badge of shame, hallmark of the lazy lady and the careless wife, today the can opener is fast becoming a magic wand ...We want you to believe just as we do that in this miraculous age it is quite possible - and it's fun - to be a "chef" even before you can really cook. What happened to Alice's library of books and her recipe collection? In his introduction to Staying on Alone. The Letters of Alice B. Toklas Gilbert Harrison writes 'She was addicted to cook books and could never settle on where her treasures should go. She kept revising her will, leaving them to one beneficiary, then another.' (p.xiv) In the end apart for a few tokens and the royalties from her books, her estate went to her old friend, Louise Taylor (whom she had met when they were music students together) so perhaps she was the final custodian of Emma Levinsky's hand written recipes and Alice's large cardboard box. Louise Taylor died in 1977. * There is a video of an interview with Leon Katz on YouTube (Katz spent several months interviewing Alice at the time she was writing The Alice B. Toklas Cookbook) in which he claims to have typed the manuscript for the cook book. Burns, Edward (ed.). Staying on Alone. Letters of Alice B. Toklas, Liveright, New York, 1973. Malcolm, Janet. Two Lives. Gertrude and Alice, Yale University Press, New Haven, 2007. Simon, Linda. The Biography of Alice B. Toklas. Doubleday, New York, 1977. Souhami, Diana. Gertrude and Alice, Phoenix Press, London, 2000. Stein, Gertrude. The Autobiography of Alice B. Toklas, Zephyr Books, Stockholm, 1947. Thorne, John. Mouth Wide Open. 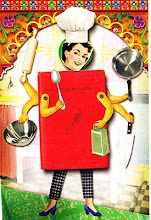 A Cook and His Appetite, North Point Press, New York, 2007. Toklas, Alice. The Alice B. Toklas Cook Book, Harper perennial, New York, 2010 (1984 edition). What is Remembered, Michael Joseph, London, 1963. Aromas and Flavours of Past and Present, Michael Joseph, London, 1959. Thanks for a great summary of the evolution of Alice's cookbook.